LAS VEGAS (April 27, 2017) – MGM Resorts International and New York-based Sydell Group announced that Primrose will be one of the first restaurants that has opened at Park MGM in Las Vegas. 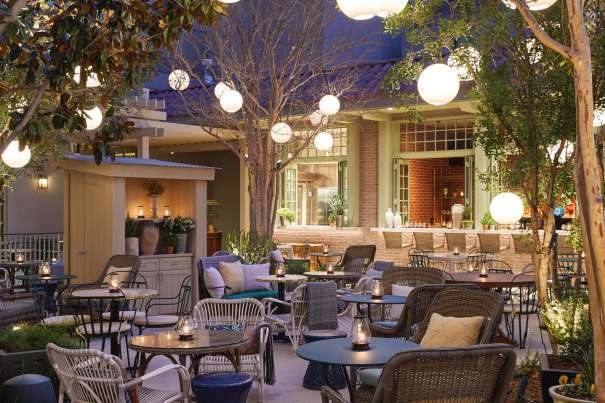 The restaurant, features a South of France-inspired, vegetable-forward menu, with an emphasis on open-fire cooking, and opened in the fall 2017 as part of the property transformation from Monte Carlo Resort and Casino into Park MGM. Situated between the inviting Park MGM lobby and pool, the restaurant is both approachable and engaging. Interior designer Martin Brudnizki – whose celebrated restaurant work includes The Ivy, Le Caprice and Annabel’s in London– designed the space to have a residential feel, evoking a series of rooms in a country house leading out to a lush garden and terrace inspired by Southern France. Primrose is a key part of the culinary offering at Park MGM. The restaurant is managed by Sydell Group, owners and operators of trend-setting boutique lifestyle hotels across the country, each highly regarded for their food & beverage concepts, including The NoMad in New York; The Line in Los Angeles; and Freehand in Miami & Chicago. In spring of 2017, MGM Resorts and Sydell Group announced a partnership to reimagine and rebrand Monte Carlo Resort and Casino, to include two distinct new hotel experiences: the launch of Park MGM, and a Las Vegas version of Sydell’s widely acclaimed NoMad Hotel. In addition to fully redesigned and renovated hotel guest rooms, each hotel will feature innovative and exciting food & beverage experiences unique to the Las Vegas market, including the award-winning NoMad restaurant by Chef Daniel Humm and restaurateur Will Guidara and Eataly’s vibrant Italian marketplace. Park MGM and The NoMad Las Vegas become the final pieces of MGM Resorts’ complete neighborhood redesign of the central Las Vegas Strip neighborhood, which began in 2009 with the introduction of CityCenter and the recent unveiling of The Park, a spectacular outdoor dining and entertainment district, and the stunning new T-Mobile Arena. A partnership between Ron Burkle and Andrew Zobler, Sydell Group is the creator and manager of unique hotels deeply rooted in their location and architecture. Sydell’s core expertise is an ability to collaborate with original talent within the world of design, food & beverage, and retail, and bring them together in the creation of compelling new hotels that engage the communities around them. Sydell Group’s diverse portfolio of award-winning properties includes The NoMad, New York; The Line Hotel, Los Angeles; Freehand Miami & Chicago; as well as upcoming openings in Los Angeles, Washington, DC; London; and New York. MGM Resorts International (NYSE: MGM) is one of the world's leading global hospitality companies, operating a portfolio of destination resort brands including Bellagio, MGM Grand, Mandalay Bay and The Mirage. The Company opened MGM National Harbor in Maryland on December 8, 2016, and is in the process of developing MGM Springfield in Massachusetts. MGM Resorts controls and holds a 76 percent economic interest in the operating partnership of MGM Growth Properties LLC (NYSE: MGP), a premier triple-net lease real estate investment trust engaged in the acquisition, ownership and leasing of large-scale destination entertainment and leisure resorts. The Company also owns 56 percent of MGM China Holdings Limited (SEHK: 2282), which owns MGM MACAU and is developing MGM COTAI, and 50 percent of CityCenter in Las Vegas, which features ARIA Resort & Casino. MGM Resorts was named among FORTUNE® Magazine's 2016 list of World's Most Admired Companies®.